At this place you learn about new activities of RP Photonics Consulting GmbH. If you are interested in software, please have a look at the RP Photonics Software News, which you can receive as an e-mail newsletter or using an RSS feed. We also regularly publish the Photonics Spotlight with interesting news and useful information in the area of photonics, particularly laser technology and applications. The former title, focusing entirely on lasers, increasingly got too narrow. Particularly this year, the encyclopedia is extended more and more (now having already 705 articles), covering much of the area of photonics. Also, the new title is more consistent with that of the RP Photonics Buyer's Guide, with which the encyclopedia is intimately connected. Finally, it is nice to have a shorter and more concise title. During the last years, RP Photonics one more expanded its activities in the area of photonics and laser marketing. 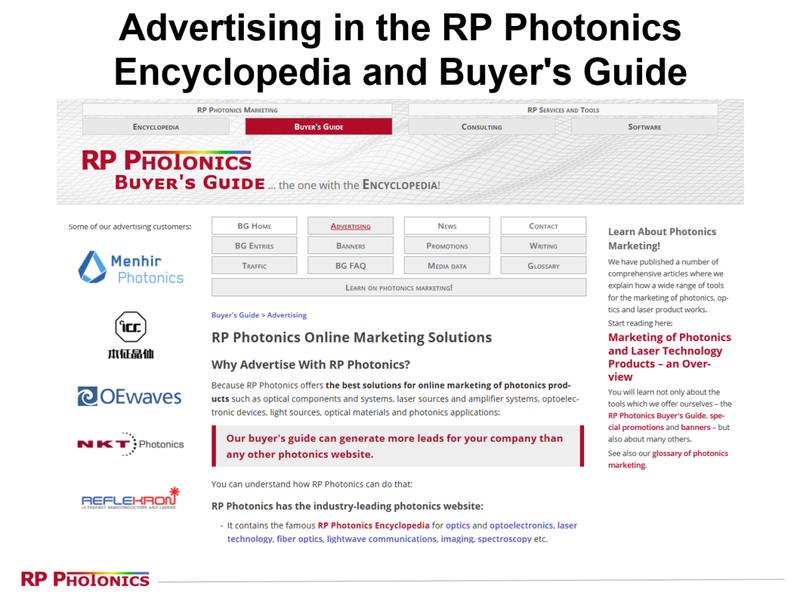 In 2012, we introduced the RP Photonics Buyer's Guide, and meanwhile this has been adopted by many advertisers as a highly useful marketing tool. Recently, we have done a further substantial revision of the buyer's guide offers, with which we further increased the value of the advertising while making the system even substantially simpler to use. We expect that this will give our photonics marketing activities a further boost. We have also heard from some of our advertisers that they are getting a lot of valuable traffic from our site – in fact much more than from any other website. If you are a supplier, we warmly recommend that you have a look in order to check out the exciting opportunities for your business! We have completely revised the design of our website. Our primary goals were to make it more modern and even easier to use. To that end, we have changed many details, including the main navigation in the header, the other navigation items and of course also the content region. You may notice the different font used, the larger font size, and the now automatically scaling figures. The design also became much more responsive in the sense that it can be used on screens with quite different sizes. We have introduced substantial revisions of our advertising offers in the RP Photonics Buyer's Guide. Essentially, our new ad package has become much more powerful for branding and lead generation, and only for special promotions you need to pay extra. So our advertisers get strongly improved results with the system, which also became substantially simpler for them to handle. Read the revised details of the buyer's guide entries and of our revision. The new script editors support useful features like a line number display, syntax highlighting and multi-level undo/redo functionality. There is a handy syntax checker: find syntactical errors before executing a possibly time-consuming script. You can also automatically reformat code in order to get a consistent formatting. There is now a powerful debugger for scripts, which makes it much easier to locate and fix errors in sophisticated scripts. With that, you can execute your scripts command by command. 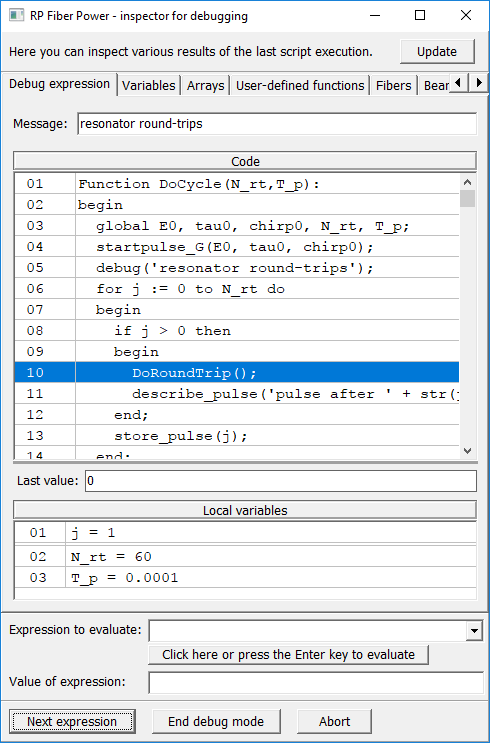 Debugging is even possible within mathematical expressions! So it became much easier to find and fix errors in your scripts. More and more, our software also becomes a nice replacement for MATLAB in many cases. While it is not specialized on matrix operations, where MATLAB offers a lot, it is very powerful for many numerical operations. Certainly, it is not necessary to have a MATLAB interface for obtaining flexible scripting capabilities – these are already built in! Users of older versions have obtained fair upgrade offers: an upgrade costs little more than the difference in license prices. Note that we have also published new brochures on the products RP Resonator, RP Coating and RP ProPulse. We have introduced another option for advertisers: the promotion of white papers and videos. A graphical preview of such a thing can be placed in a well visible box within a specific encyclopedia article. This means that your white paper or video will be seen exactly by those readers who are interested in a specific topic. Obviously, this is much better than e.g. just putting it on some general pages or into some white paper archive. We are permanently working on improvements of our RP Photonics Buyer's Guide – both for the users and the suppliers. Recently, we have introduced the new “ad packages”, with which suppliers can enhance the visibility of their entries in a simple manner. The new rules are nicely explained online and in a PDF document. A couple of months ago, we have introduced the new custom forms in our software RP Fiber Power. These can be made for specific simulation tasks – either by the user himself or within the technical support. This feature is now also available in RP Resonator. Particularly for the daily tasks, this extension is very useful. 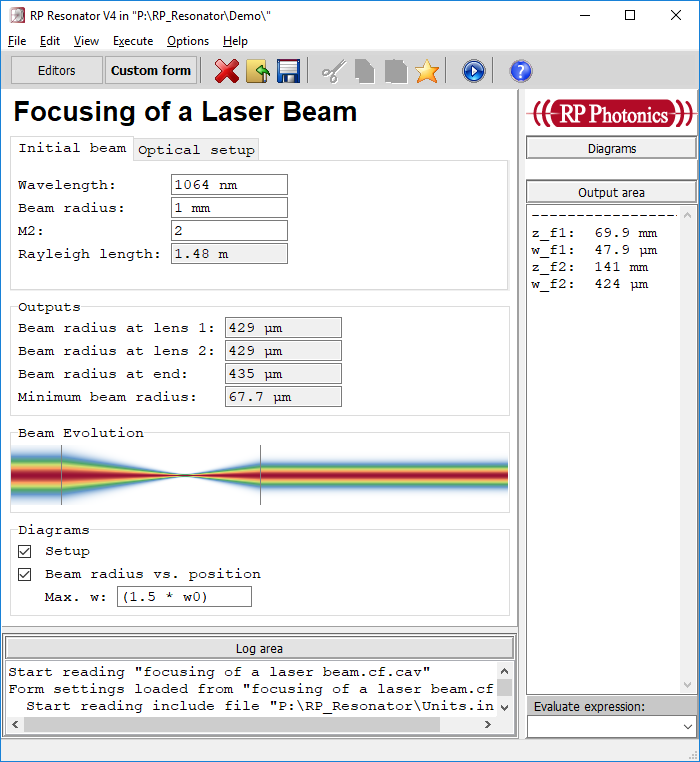 For example, you can now very simply calculate the focusing of a laser beam by simply entering the required inputs (the original beam parameters, the focal lengths of one or two lenses and their positions) into the form. The outputs are displayed in the same form and in some graphical diagrams. RP Photonics will attend the conference ASSL (Advanced Solid-State Lasers) in Berlin in October 2015. The exhibition, where RP Photonics has the booth 123, is open from October 5 to 8. There will be an opportunity to see our software running on a notebook, so that one can have a direct impression and ask questions. The RP Photonics website is now using encrypted data transmission, using the HTTPS protocol (instead of HTTP) for all pages. For example, the encyclopedia main page will now be accessed via https://www.rp-photonics.com/encyclopedia.html. There is an automatic redirection for http requests to https. In your browser, you see a small lock icon in front of the page address. The only disadvantage of that change is that the data transmission becomes somewhat slower. However, we think that this effect is quite acceptable. You will still enjoy the high speed of our very fast web server. RP Photonics has now got a Facebook page: http://www.facebook.com/RP.Photonics We will probably not be very active there, but occasionally post messages on new articles, for example. The RP Photonics website, which is probably the most popular website in the area of laser technology, is now hosted on a substantially more powerful server. The previous server was already reasonably fast, but users can now enjoy an outstanding performance. There is a new version V6 of the RP Fiber Power software. This time, the user interface has been substantially improved: you can now use custom forms which are tailored to specific simulation tasks and can be defined either by the user or provided within the technical support. With this improvement, the software can now be better used by many who need to carry out certain calculations without digging too deep into technical details. See also our quick start demo video. When working on the development of fiber amplifiers or lasers – either in industry or within scientific research projects – it can be extremely useful to have a quantitative understanding of the processes in these devices. That is one of the important benefits of computer modeling. However, many people may be hesitating to get into this field, feeling that it is difficult to get started. Mainly in order to help in this situation, we have published another free online tutorial with the title "Modeling of Fiber Amplifiers and Lasers". In contrast to an earlier tutorial titled "Fiber Amplifiers", it focuses on concepts and methods of modeling rather than on the underlying physics. Various issues related to simulation software are also addressed. On Sunday (Feb. 8) from 13:30 to 17:30, there will be the half-day short course on "Laser Beam Quality" (SC818). On Monday (Feb. 9) from 08:30 to 17:30, the full-day short course "Applied Nonlinear Frequency Conversion" (SC931) will take place. Make sure to register for the courses in time via the SPIE website. If you like to meet Dr. Paschotta in San Francisco, just contact RP Photonics. In the context of our 10-year anniversary, RP Photonics has started to offer the new fiber optics software RP Fiber Calculator for free – even for commercial use! Users don't even have to register with us; if they like, they can stay completely anonymous. So we don't trade software for addresses. After our extremely popular Encyclopedia of Laser Physics and Technology, our free fiber optics tutorials and many other useful resources on our websites, this is another gift from RP Photonics to the worldwide photonics community. Our economical principle is: Be useful for many, and you are fine! In the beginning of June 2014, we will celebrate the 10th anniversary of RP Photonics. The company was originally founded in Zürich, Switzerland, in 2004, and moved to Bad Dürrheim, Germany, in 2010. We mention that already because some journalists and others may want to prepare articles on our company, which we think is a quite special and remarkable one. Presumably, most people working in photonics worldwide know RP Photonics at least from our website, hosting the famous Encyclopedia of Laser Physics and Technology and also the RP Photonics Buyer's Guide. On Sunday (Feb. 2) from 08:30 to 17:30, he will give the full-day short course "Resonator Design for Solid-State Lasers" (SC860). On Tuesday (Feb. 4) from 08:30 to 17:30, the full-day short course "Applied Nonlinear Frequency Conversion" (SC931) will take place. On Wednesday (Feb. 5) from 13:30 to 17:30, there will be the half-day short course on "Laser Beam Quality" (SC818). We have now also published a tutorial on fiber amplifiers. So far it has 7 parts, and more parts, covering aspects like the amplification of ultrashort pulses and amplifier noise, will follow soon. We expect that nearly everyone dealing with fiber amplifiers can learn something useful from it. On our website, we have published a comprehensive tutorial on passive fiber optics. It has 11 parts, covering topics like fiber modes, polarization issues, chromatic dispersion and nonlinearities, and even the propagation of ultrashort pulses and signals in fibers. Both for beginners and for people already having some experience in fiber optics, this tutorial should be extremely useful. Dr. Paschotta presented a webcast on “Ultrafast Lasers and Optics”. Since 2006, RP Photonics has published the Photonics Spotlight, a blog on laser physics and technology. We have now decided to also offer this in the form of a newsletter. The advantage is that if you subscribe to the newsletter, you are regularly seeing it, while otherwise you may forget to come back to that page and read our articles. At the same time, we also introduce the RP Photonics Software News, a new blog which focuses on simulation & design software in photonics. This is particularly useful for people already using our software, as they are then regularly informed about upgrades and updates, new features, tips for efficient use, etc. People who have not yet got a license, but are interested in it, may also find it interesting to read this. In order to get the newsletters, simply go to our page on newletters. The look & feel has become nicer in various respects. Due to the new navigation box on the top right corner, it has become easier to move between the company website (consulting & software), the Encyclopedia of Laser Physics and Technology and the RP Photonics Buyer's Guide. A couple of new encyclopedia articles have been published. The topics are mirrors, prisms, total internal reflection and neutral density filters. Many encyclopedia articles now contain one or several convenient calculator forms. For example, the article on beam quality contains a calculator for properties like M2 factor, beam parameter product, beam waist radius and divergence half-angle. Our website has long become extremely popular. AWStats shows us around 50 000 unique visitors each month. The RP Photonics Buyer's Guide is also used a lot, and many thousands of times per month we send somebody to a supplier of some photonics product. From May 12 to 16, 2013, there will be the Laser Exhibition (World of Photonics) in Munich. If you want to meet Dr. Paschotta there, please contact us before the exhibition. Dr. Paschotta will also give a short course on Fiber Amplifiers – a good opportunity to learn something on that hot topic and to get an impression of how you could benefit from RP Photonics in other ways. Note that RP Photonics is also offering the powerful simulation software RP Fiber Power. If you want to see that in action, make sure that you will meet Dr. Paschotta during the conference and exhibition. He will have the software on his notebook. On Sunday (Feb. 3) from 08:30 to 17:30, he will give the full-day short course "Resonator Design for Solid-State Lasers" (SC860). Also on Sunday, at 14:15 Dr. Paschotta will give a talk on “Optical Components for Ultrafast Lasers” in the Lasers & Photonics Marketplace Seminar of LaserFocusWorld, which takes place in the W Hotel. On Thursday (Feb. 5) from 8:30 to 12:30, there will be the half-day short course on "Laser Beam Quality" (SC818). It should still be possible to register for the courses at SPIE. For many years already, RP Photonics internally used its thin-film design software RP Coating. Now, this software also becomes available for external users. Compared with competing products, RP Coating has an outstanding flexibility due to its powerful script language. A couple of demo files show how easy it is to apply the software in advanced case studies. For example, it is used to analyze and design dichroic mirrors, thin-film plate polarizers and rugate filters. It is also possible to read and write binary and text files with arbitrary formats – for example, in order to read data from a spectrometer and write data for controlling a coating machine. The RP Photonics website has been substantially expanded by the introduction of the new RP Photonics Buyer's Guide. This is a large database of suppliers for photonics products. Hundreds of suppliers are listed already (by name and by products), and more will follow. It is intimately connected with the Encyclopedia of Laser Physics and Technology, which has become extremely popular. This gives the users immediate access to supplementary high-quality scientific and technical information. Readers of encyclopedia articles can move to the buyer's guide with a single click. The page layout is simple and clear, not excessively covered with advertising, so that the user experience will make it attractive to use this resource. Both for users and suppliers, it is easy to use. For these reasons, we expect the RP Photonics Buyer's Guide to become another very popular service of RP Photonics for the worldwide photonics community. Any so far missing suppliers are welcome to register, using a simple registration form. Suppliers can have enhanced entries for better visibility of their companies and products. The banners in the right column of all encyclopedia pages are now also displayed in the buyer's guide and thus obtain a further increased value. Banners and company profiles can also host videos. On August 27, 2012, Dr. Paschotta will give a two-hour course (tutorial) with the title “Understanding fiber amplifiers” at the Europhoton 2012 conference, which will take place in Stockholm. That course is part of the Summer School “Frontiers of Solid State Light Sources”. For Ph. D. students and post-docs, the attendance of the course is included in the conference fee. The well known optics.org reports in its 2012 media pack that it had over 1,050,000 page views in one year – well below half that of RP Photonics. The whole website of the Optical Society of America – apparently including its Green Photonics Guide (a buyer's guide) – reports in its media kit 133,000 page views per month – again far below those of RP Photonics. photonics.com, the old flagship of advertising in photonics, reports 231,000 page views per month, i.e., values which are only slightly higher than those of the RP Photonics website. Note that such numbers don't tell the full truth. One can imagine that in a buyer's guide, a substantial part of the traffic can come from the advertisers themselves, who explore that place and check or update their listings regularly. In contrast, the Encyclopedia of Laser Physics and Technology attracts huge numbers of readers searching for useful information, and in this mode being ready to pick up any interesting news. Many may wonder: How on earth can it be that RP Photonics Consulting GmbH, a one-man company founded in 2004, has a website with as much traffic as the old flagship photonics.com, and substantially more than other famous websites? It is presumably because content is king: RP Photonics offers a quantity and quality of trustworthy technical and scientific information which is probably unparalleled in this technical area. Even though the core area of RP Photonics is definitely photonics, consultancy on energy matters (going far beyond the photonics area) is now also offered. Since his youth, Dr. Paschotta has dealt with energy issues and acquired a comprehensive expertise. Further strong points in this area are his deep scientific understanding of physics and his capability to analyze complex situations with difficult trade-offs. Dr. Paschotta has published the RP-Energie-Lexikon (in German), a comprehensive open-access resource on energy matters. This activity is understood as another service to the public, and the support of the public interest is its primary goal. In particular, Dr. Paschotta tries to support our societies in attempts to mitigate the hazards of climate change and manage the transition to sustainable production and use of energy. As a consultant, he can help, for example, to comprehensively analyze options for the efficient use of energy. Several new video demonstrations for the software RP Fiber Power have been prepared. These nicely illustrate how this software combines an easy handling with uttermost flexibility. At the Photonics West conference in San Francisco, Dr. Paschotta received the honor of becoming a fellow of the SPIE. Only particularly distinguished SPIE members are elevated to that grade. Dr. Paschotta's research on passively mode-locked lasers has been recognized, also his service to the worldwide photonics community in the form of the open-access Encyclopedia of Laser Physics and Technology. See also the SPIE press release.